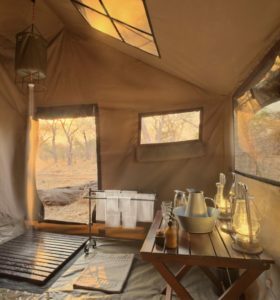 This is luxury fly-camping in intimate semi-permanent camps, under the expert care of highly trained guides and camp staff. Guests are assured of exhilarating camping, in the classic African style and comfort of tented travel – definitely in a league of its own. Tents are spacious, each with double bed, en suite bathroom, separate toilet, and romantic al fresco bucket shower (hot water delivered upon request). Camps have a maximum of 6 tents, in a private wilderness camp. For Botswana there are two areas within Chobe National Park. The Park encompasses 11 700 square kilometres, bordered in the north by the beautiful Chobe River, and buffered on all sides by wildlife management areas and forest reserves allowing for the free movement of game. A wildlife enthusiast’s dream, Chobe National Park is one of the top wilderness reserves in the world and is home to the largest single concentration of elephant. Throughout the year, herds of buffalo and elephant can be seen drinking at the river’s edge with their numbers swelling into hundreds and thousands during the dry season. Two endemic species of antelope occur here (in the north of the Park), the puku and the Chobe bushbuck. Due to the variety of the Chobe vegetation and geological features, this magnificent wildlife sanctuary offers extreme contrasts and a fantastic cross section of wildlife. During the rainy season, the Savute section of Chobe National Park hosts the annual zebra migration, which peaks in January and February when the zebra and wildebeest congregate in vast numbers to graze on the sweeter grasses brought on by the rains. It is not uncommon to also catch sight of leopard, cheetah and African Wild Dog. Savute also supports the greatest concentration of the king of all beasts – the lion. The landscape of Savute is strikingly different from the lush Chobe riverfront, with an almost desert – like feeling that has animals escaping the heat by grouping together in the limited available shade. The stark dead trees found in the dry Savute channel are evidence of an erratic flow of the Savute River over the years. Locations: Northern Chobe camps are on or near the banks of the Chobe River, while the Savute camps are in and around the Savute Channel. Guests can enjoy twice-daily game drives, in semi-open safari vehicles, with a guaranteed ‘window’ seat. Combine your stay at the Under Canvas Luxury Camping with a stay in Botswana’s premiere destination The Okavango Delta.